Forget take-out! If you can boil water and have minimal kitchen knife skills, you can have this Chinese Chicken Spaghetti on the table in no time. 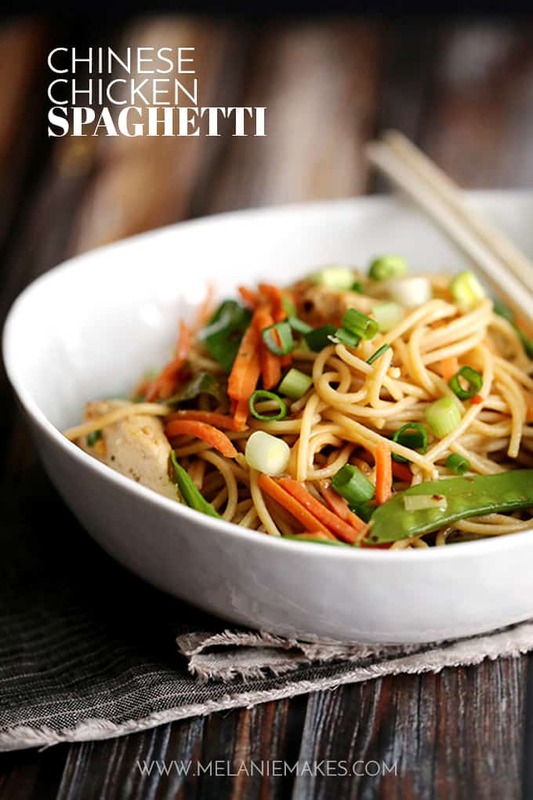 Whole grain spaghetti is topped with stir-fried carrots, snow peas and green onions and tossed in a soy based sauce, to create a quick and delicious main course. I received this cookware from OXO to use for this recipe, but received no other compensation. As always, all thoughts and opinions are my own. Thank you for supporting this sponsor that allows me the opportunity to create content, such as this, for Melanie Makes. When we got married, one of my roommates from undergrad made me a binder which he titled “Mel’s E-meals” for me to be able to print out recipes I found online or in magazines and keep them in a single location. That was nearly 13 years ago and although I haven’t added a new recipe to the binder in quite some time, it still claims valuable space within my cookbook library as I love being able to look back at the first recipes I cooked for the two of us as newlyweds. 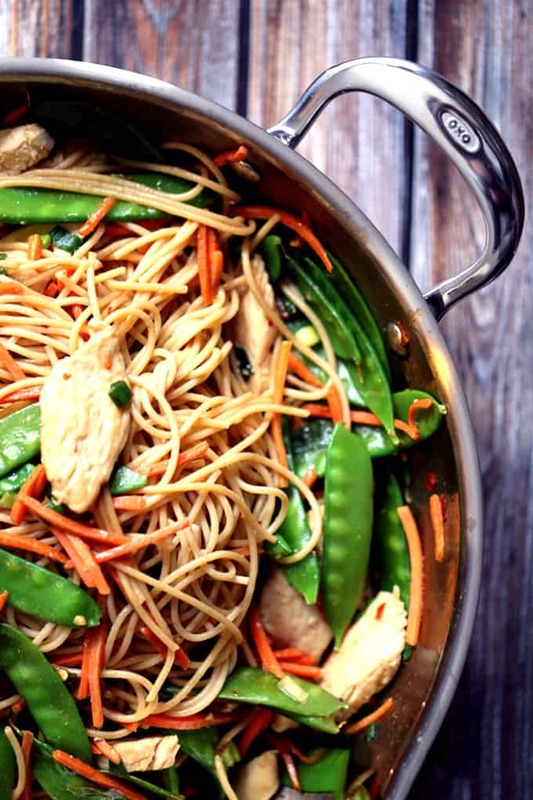 This Chinese Chicken Spaghetti is one of those dishes. 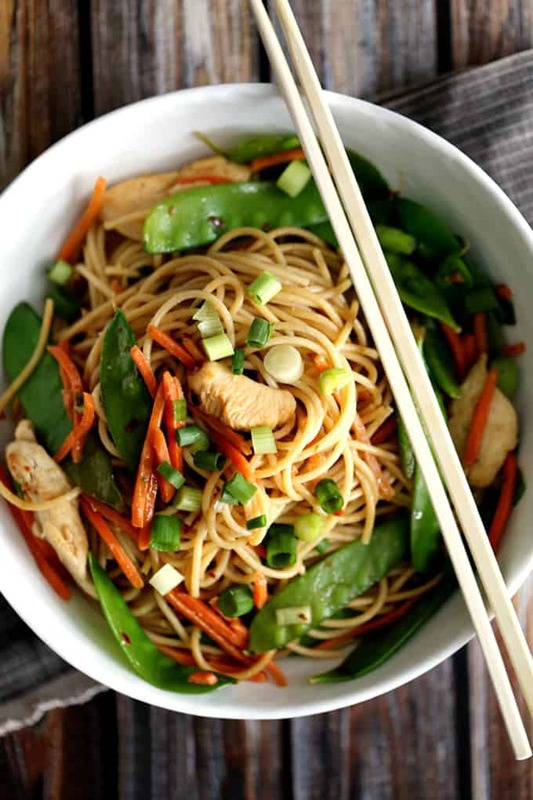 Whole grain spaghetti is topped with stir-fried carrots, snow peas and green onions and tossed in a soy based sauce combine to create a quick and delicious main course. Seriously, there is so little work involved in creating this meal. If you can boil water and have the knife skills to chop green onions and slice chicken, you can have dinner on the table in no time. It’s one of my favorite spaghetti recipes in my files alongside my Baked Spagansa, Chicken Bacon Swiss Spaghetti Pizza and Chicken Parmesan Spaghetti Pie. Even better? This recipe was the perfect choice to give OXO’s new Stainless Steel Pro Cookware a try, specifically their 12 inch Wok + Cover. When we created our wedding registry, I had added a wok and although we were grateful to receive it, I was able to use it less than a year as it was less than stellar quality. With a scratched finished and inability to maintain temperature, it quickly found a new home elsewhere as I wasn’t able to justify it taking up valuable kitchen real estate. This OXO wok? It works like a dream and with just one use proved itself worthy of sticking around to make another meal. It’s 5-quart size is perfect – not too big, not too small! – and I can see using it often in the future. Not only did it heat evenly thanks to a heat-radiant aluminum core fused between the two layers of stainless steel, but it’s handles stayed cool throughout the cooking process allowing me to comfortably move the pan as needed without issue. It also transferred from stovetop to table with ease and clean-up was a breeze. Although it is dishwasher safe, with a swipe of a soapy dish rag it was clean in just minutes. I love that a meal that we first enjoyed years ago has now become a favorite of our entire family thanks to the addition of a new wok to my kitchen arsenal. I mean, crisp, colorful vegetables, chicken and pasta – how can you go wrong? Cook pasta to al dente, according to package directions. Meanwhile, in a small bowl, whisk together cornstarch, soy sauce, sesame oil, vinegar, ginger and red pepper flakes. Set aside. In a large wok, add oil and stir-fry chicken until juices run clear. Remove to a plate and set aside. Add snow peas and carrots and stir-fry until crisp tender, about 5 minutes. Add green onions, and stir together. Return chicken to pan and toss with vegetables. Stir in soy sauce mixture and add pasta to wok, tossing to combine. Serve immediately. After you’ve added this Chinese Chicken Spaghetti to your dinner rotation, you’ll definitely want a few more ways to make spaghetti as well! Check out this Summer Italian Spaghetti Salad recipe, these mashup Baked Spaghetti Tacos and this light and delicious Lemon Spaghetti. How fun to flip through those recipes! I'm going to go do the same for inspiration! I hope I can find something that is equally as yummy as this dish! It looks so tasty (and easy)! Yes!! My kind of spaghetti!! I would love to try this without the chicken - YUM! Maybe through some edamame in for some extra protein? This sounds amazingI can't wait to make it. I love all those veggies! A must try recipe! This looks so fresh and delicious. I love Chinese flavors! This is so unique!!! It's a must try with all of the great flavors. Can u use soba noodles. A friend gave them to my son, I have a ton of this stuff and I never cookd with them before. Though I would love to make this recipe with this. Can i do so? Hi, Cecillia! I think if you cooked them according to package directions you could substitute without any problems. Let me know your end result if you give it a try! I love simple recipes that look and sound like you spent hours in the kitchen - but didn't. This sounds so good and perfect for a busy weeknight. Thanks so much, Joanie - I love that it packs so much flavor with so little effort! 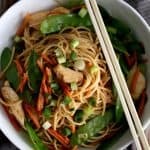 sounds amazing Melanie, love me some chinese noodles! I'm right there with you, Krista! I need a good wok and I love OXO. I also have minimal knife skills (meaning I cut myself 1 in 5) and I do love a good easy meal! This wok is awesome, Angela! And minimal knife skills are perfect for this dish - hope you'll give it a try! I have this same shiny pan waiting to be broken in over the weekend. This dish sounds awesome - I love everything in it! I have no doubt you'll love that wok and this recipe, Heather! This look fantastic. One can never have enough noodles! Love that story about the recipe binder. So cute! Thanks so much, Liz - so appreciate it! Such an awesome memory! Love this recipe too! OMG this looks so delicious and easy! Thanks for sharing! MMMM! I am all about that chinese lately! And love this easy and quick takeout takeout! You could have this made before your takeout arrived, Meg! 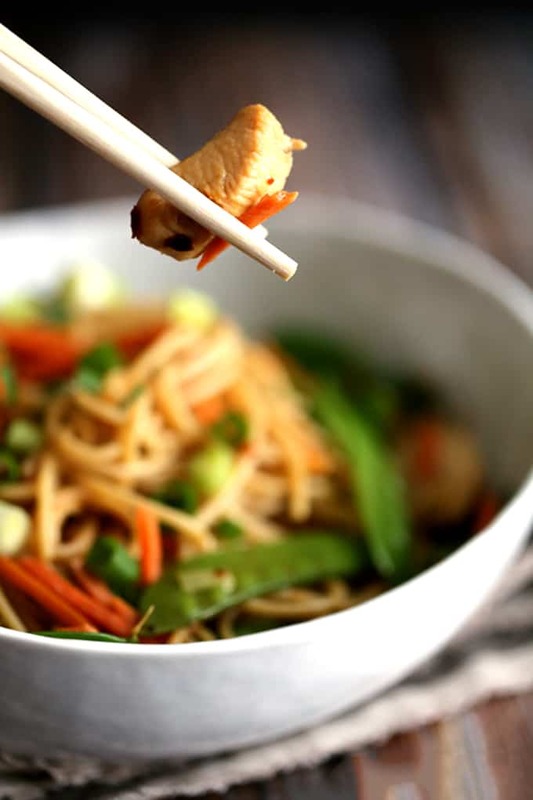 Craving a bowl of this chinese chicken spaghetti right now - I love any dish with Asian flavours and ingredients! I couldn't agree more, Thalia! This sounds so delicious, I love easy meals like this! I love a good wok! This is the perfect meal for one--I love the fresh veggies and the flavor in this dish. And it makes for great leftovers the next day for lunch!